Eye On Sports Media: Book Review: Jim Nantz's "Always By My Side"
Book Review: Jim Nantz's "Always By My Side"
Athens, GA (May 5, 2008) - Sitting down watching the Master's over the past few years, we have noticed little change in the way Jim Nantz has called the action from the tower over the 18th green. The steady, calm voice would tell the story unfolding for the audience. Ever steady, his voice made you confident that that you were indeed watching a special event. However, things were not really so steady in his life as he has had to grapple with personal tragedy in his life, but who outside of a small circle of people knew. This year, I was not watching the final round of the Masters. Instead, I was sitting on an airplane headed for Los Angeles. But I could still hear Jim's voice in my head as I read his new book, Always By My Side: A Father's Grace and a Sports Journey Unlike Any Other (Jim Nantz with Eli Spielmen,Gotham Books, May 2008, 273 pages, ISBN-10: 1592403611, ISBN-13:978-1592403615). To me, the measure of a good book is not the words that are printed on the page, but the pictures they paint and the emotions they evoke. And as I finished the book, I sat there crying as I thought of the relationship I did not have with my now-deceased father and as I thought of my own mother battling dementia in a nursing home. You see, Jim's book is a not a typical sports memoir. It is a story of deep love and respect for his father, and the pain of not being able to be with him as Alzheimer's disease stole the father Jim loved so much. It is the story about not being able to celebrate the high point of a career with the man you know guided and nurtured you to that point. You will notice that I refer to the author of this book by his first name. This is because I first met him when he was starting out on CBS Sports Golf Coverage and was surprised by how he treated everyone with open arms and kindness. 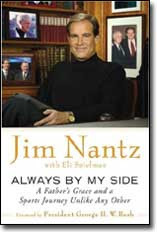 I did not know him as Mr. Nantz, just Jim. He probably does not remember me at all, nor would I expect him to. I have not had the pleasure of seeing him since I the Washington, DC area over 14 years ago, but this new book opened a floodgate of memories that I had not thought of in a long time. The book is at its absolute best when he is is telling the story of the relationship he has lived with his father, and of how specific people have been father figures and role models to him over the years. The book, thankfully, is not written to be a manipulative tear jerker. But when you read what he has written and weaved throughout the book, a reader would have to be lying if they say they were not moved in some way. Without giving away the ending, all I can say is that I was hit in the gut as much by the closing as I was with his personal disclosures in the first chapter. The book is at it weakest when some things seem to be written just for the sake of getting names into the book so nobody would be forgotten. At one point, he quickly rattles off the names of a number of CBS Sports producers and directors in one sentence, without going into more detail of his relationship with them or how they fit into the whole growth of his career. At another point, he briefly mentions "research maven John Kollmansperger." Outside of anyone at CBS Sports or elsewhere that has worked with John (also known as JK), this has absolutely no meaning to ayone reading the book. Don't get me wrong, a lot of information readers of this book have seen presented on CBS Sports startiing back in 1987 came from JK's attention to detail. Without adding additional background on JK, readers will be left to scratch their heads. There are also a couple of areas of the book that left me, as a reader, wondering. Very little is written about the relationship between Brent Musberger and Jim. Musberger's professionalism is noted, but nothing is said about the relationship between the two men and what Jim was REALLY thinking on April 1, 1990 when the axe fell. And then there is Billy Packer. Jim refers to Packer as a good friend, but I can't help but feel he is throwing Packer under the bus in describing an incident when Packer was on his knees and knees picking up shards of broken backboard glass so that he could use them to cash in and make money. While Jim may have felt he wrote that to help explain what makes his longtime broadcast partner tick, it only shows a side of Packer that I have heard from many people who know him personally and drives their distaste for him. Putting these things aside, or perhaps even considering them, readers will not be disappointed by this book. Who knew that Clint Eastwood made adult films, as described by Nantz? Does anyone really know, or remember, who besides Fred Couples he shared a room with in college? And who knew that the calm person we see in Jim Nantz really has enough chutzpah to walk up and ask for what he wants, without apology? So if you should chose to read this book, and I really think you should, enjoy the stories from the sports world that Jim tells. More importantly, reflect on the relationship you have or had with your parents, and the relationship you want to have with your children. For make no mistake about it, Jim is hammering home how important it is for children to have a strong father in their lives. I do not know if I will be able to make it over to Sugarloaf next week for the AT&T Classic, but if I do, I will make it a point to seek out and thank Jim for this book and for this oh so important message.